Of course, Dr. Lawson can use traditional amalgam (“silver”) for your fillings. But you can also choose from a variety of other options, including composite resins — tooth-colored materials made of glass and resin — that can mimic your natural teeth in translucency, gloss and texture. Best of all, composite fillings not only look better, they also chemically bond to the healthy tooth structure. Teeth damaged by more serious decay can become unbearably sensitive (in addition to being unsightly). Here, “crowning” damaged teeth with a full coverage of porcelain or precious metal can prevent further damage while restoring your natural look. Tooth-colored crowns match your existing teeth for a bright smile. Crowns typically require two visits (tooth preparation and design ,then setting of the crown). Teeth that are stained, chipped or crooked — even teeth that should have been straightened with braces but didn’t — can be made to appear “like new” with simple bonding techniques. Custom fit to your teeth, porcelain laminate veneers permanently veneer teeth to mask a host of imperfections. Under ideal conditions, quality veneers can last 20 years. A lifetime of coffee, tea and tobacco can result in unsightly yellow discoloration of teeth (or sometimes an overall gray, dingy appearance). Fortunately, nothing in dentistry is quite as amazing as the dazzling improvements that can be seen with simple whitening techniques. Of course, the most effective whitening is done under the supervision of a dentist. In fact, some do-it-yourself products only bleach natural teeth, leaving fillings, crowns, veneers or dentures noticeably darker. • Scaling —This procedure removes hardened plaque from below the gum line. • Root Planing — Root surfaces are smoothed to prevent plaque from sticking. • Antibiotic therapy — Special medications fight disease-causing bacteria. 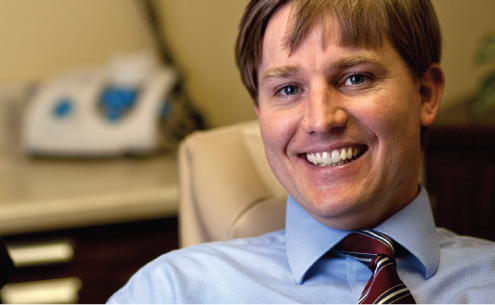 Dr. Lawson performs tooth extractions quickly and with minimal discomfort. If you have an extraction scheduled, you can feel confident that we will fully explain what to expect and will provide thorough and compassionate care.